VATICAN CITY (CNS) — Pope Francis told Italian schoolchildren that he grew up in Buenos Aires, Argentina, “the most beautiful city in the world,” and that besides playing soccer, he loved to fly kites as a child. Meeting the pope was the culmination of the “Children’s Train” initiative of the Pontifical Council for Culture and the Italian state railroad. 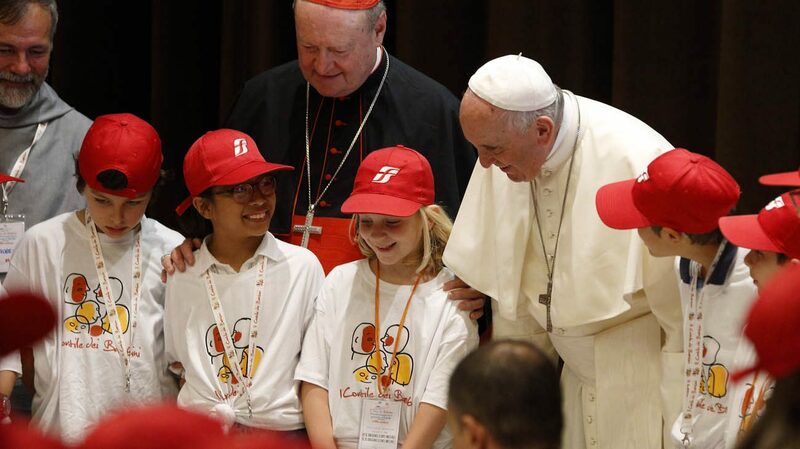 Pope Francis urged the children always to remember their first school and first teacher. “Do you remember what your teachers were like?” Anna Greta asked the 81-year-old pope. He said one of his favorite teachers was named Estela; he was in her class both for first and third grade. “She was great. She taught us how to write and read,” the pope said. Even years later, he said, he remembered her with gratitude because she helped him get started in learning. “I understood in pieces,” the pope answered. First, he decided to study chemistry and he worked as a chemist in a lab for four years, “and I liked this. But at a certain point, I understood that it did not fulfill me very much and I thought I should do something for others,” like maybe be a doctor.